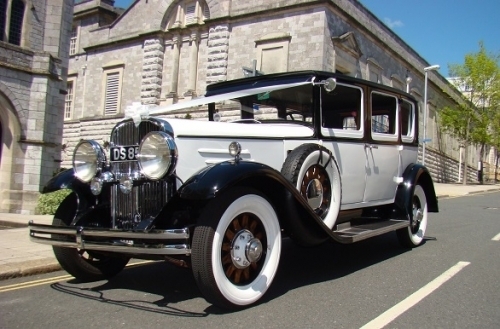 Award Winning CDEC Wedding Cars offer an original vintage 1930 Franklin 147 Salon Special, a 1927 Franklin 11b Sedan, a 1929 Buick Phaeton Tourer and a silver S-Class Mercedes. Choosing the right wedding car is one important aspect of your special wedding day. The service you receive is just as important.Our friendly chauffeurs will ensure that you arrive safe, relaxed and on time. We will work with your photographer so that no treasured moments are missed. After your ceremony, chilled champagne will be waiting for you both. I really can not praise CDEC wedding cars enough. The service we recieved before and on the day of our wedding was exemplory. Much like what other people's reviews have said, Martin made us feel very relaxed and at ease on our day and he was very professional and friendly. Not once did I feel rushed. The car was beautiful especially with the decorations (which you can choose the colour!) so all in all, a fantastic service and great value for money. I would highly recommend this company to anyone who wants their day to be perfect. Thank you.